In today’s current economic situation, there has been a lot of hope (and hype) inspired by what’s being called “green-collar jobs”. This self described new industry would appear to be the much needed solution to not only the depressingly high unemployment rates, but also the need for alternate energy sources and even a more general, cultural environmental paradigm shift. But what is the real situation when it comes to the green job market today? What even qualifies as a “green collar job”? It’s sometimes all too easy to fall for perhaps over emphasized, environmentally significant buzzwords. Recognizing this, let’s start with a couple definitions. The Green Collar Blog definition includes a broader view of green, including sustainability and corporate social responsibility type jobs. It really all comes down to an argument over what the real definition of “green” is, but let’s save that for another blog. During the 2008 presidential campaign, politicians on both sides were all over the rising popularity of “green collar jobs”, the seeming two-birds with one-stone uber-solution to both the recession and the environmental crisis, two of the biggest issues of the election. The promotion of “green-collar jobs” was popular from all angles within the election debates. 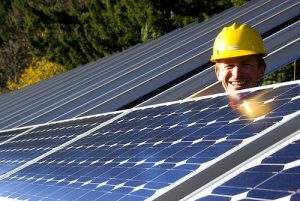 After he was elected, President Obama’s stimulus package included a good chunk of money set aside for green job training programs as well as loan guarantees for green industries, in the hopes of creating upwards of 5 million new green jobs. As time has passed, it has become apparent that more and more, the green job market is being dominated by technically focused positions, those requiring very specific training, take for example positions with wind turbine or solar panel manufacturing companies. Arguably, what we’re seeing is less of the creation of new jobs and more of a shift away from outmoded, environmentally damaging industries. Blue collar is becoming green collar. This is a good thing. There has long been a need for that shift. But at the same time, the promise of a “new” industry is turning out to be less of the goldmine that was once thought, particularly for recent graduates who find themselves competing with highly experienced professionals for entry-level positions. And to be honest, as frustrating as this might be for a young person in my position, even I have to admit that this trend of highly qualified employees flooding various environmental fields can only be a good thing for the quality and hopefully the productivity of those companies, organizations, and agencies that are sure to benefit from this trend. Hopefully this will have a visible impact on the environmental issues at hand. If you’re on the hunt for a green collar job, don’t let any of these issues discourage you. Yes the competition is pretty fierce, but the jobs are out there, and as society moves toward a more sustainable culture, the jobs are sure to follow. Right now are some amazing opportunities and some great resources out there, including various green job boards, blogs, seminars, tutorials, career fairs, etc. Green Collar Blog has a great tutorial on how and where to start your search. Great Green Careers, Green Job Search, Environmental Career, Eco Jobs, Eco.org, and Eco Employ are just a few examples of the many environmentally focused job boards that are particularly useful. In today’s day and age, it has become increasingly important to be green. A good way to do this in the business world is to do something that would help make a better environment. I suggest hvac because you can help people be more energy efficient.